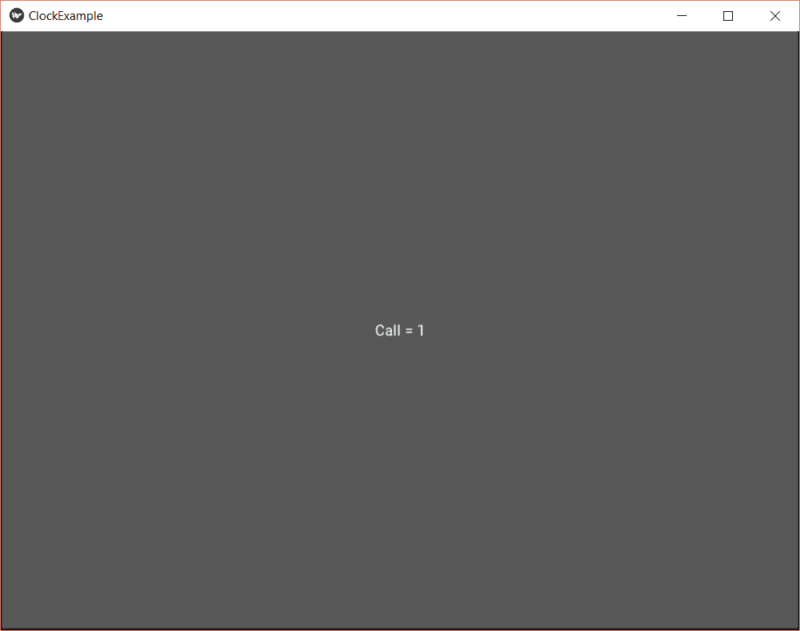 In previous tutorials, you saw how to build GUI applications using Tkinter and PyQt5, in this tutorial, we will continue building desktop GUI applications but this time using Kivy. Kivy is an open source Python library which is used to create applications on Windows, Linux, MacOS, Android and iOS. You will learn how to play with the Kivy buttons, labels, recycle view, scroll view, Kivy Canvas, and other widgets to become familiar with the library. You can design Kivy widgets using an intermediate language called Kv language as you’ll see later. Before getting started with Kivy, a basic knowledge of Python programming basics is needed. Now, let’s start from installation. 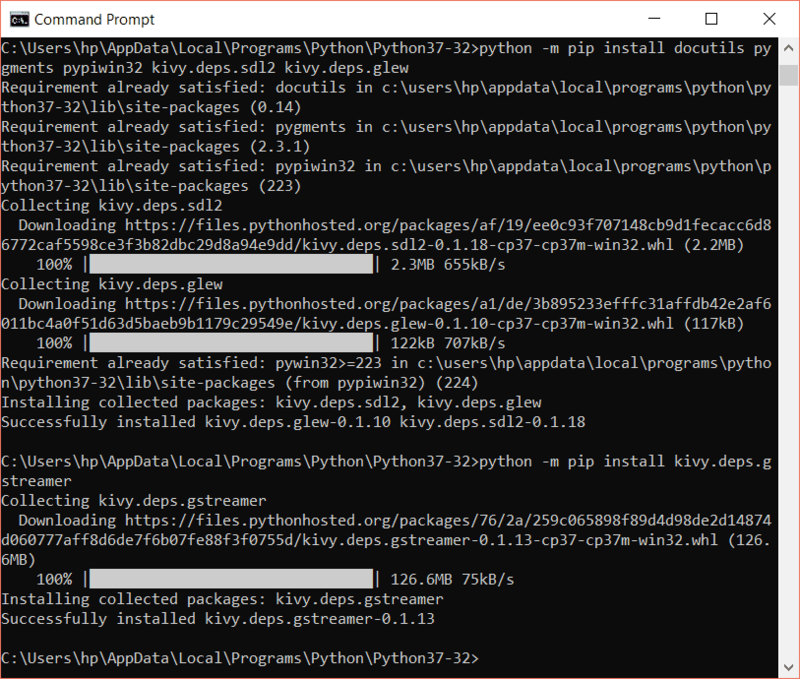 If you have multiple versions of Python installed in your computer, then you will have to install Kivy in the version that you wish to use for development. 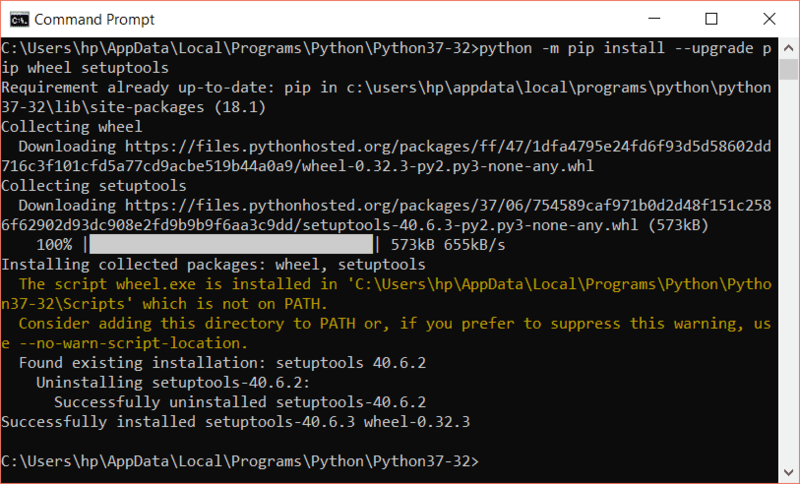 The python packages can be installed using pip. As Kivy needs compilation when installing with pip, therefore, we need wheels which is a pre-built distribution of an already compiled package. You can also use git to install Kivy but in this tutorial, we will use wheel. In this section, you will learn how to create and run a Kivy program and how to build a basic interface in Kivy. Let’s create a file with .py extension. Now is the time to write our main program. In the above snippet, a class is inherited from the App class. Then to build the application we have to return a widget on the build() function. In the code above, we have returned a label with text “Hello Kivy”. Congratulations! Your first Kivy app runs successfully. In this section, you will learn how to create a button, change the color of a button, enable/disable, how to add an image on the button and how to change the size & position of the button. The button fills the window, don’t worry, we will resize it later. To disable a button, you have to set the disabled property to True. instance.text = "I am Disabled!" In the above code, we have imported partial function from the functools so that we can use the bind() function. Then we have the update() method to update the text of our button after clicking on it. Also, you can name your function as you want. The next function is the build() function. This method runs automatically when a button is created. Then we have called the disable() method using partial. Similarly, the update() method is called to update the text of the button after it is disabled. The return value from the disable() function is bound to the on_press function of our button. Therefore, when the button is pressed, it is disabled first and then the text is updated. The pos parameter specifies the position for the button while the size_hint parameter specifies the size of the button. In this section, you will learn to add an image on a button. We will be using Kv language for the first time to create our widgets instead of instantiating them from code. BoxLayout is used to position the widgets so that widgets can be placed together in an organized manner. In Kivy, there are several layouts that can be used to organize the widgets, for example, box layout, anchor layout, float layout, etc. By default, Kivy tries to load the Kv file with the same name as your class but without the word App and in lower case. If your class is TestApp, so it will search for a Kv file with name test.kv on the same directory to load widgets from it. 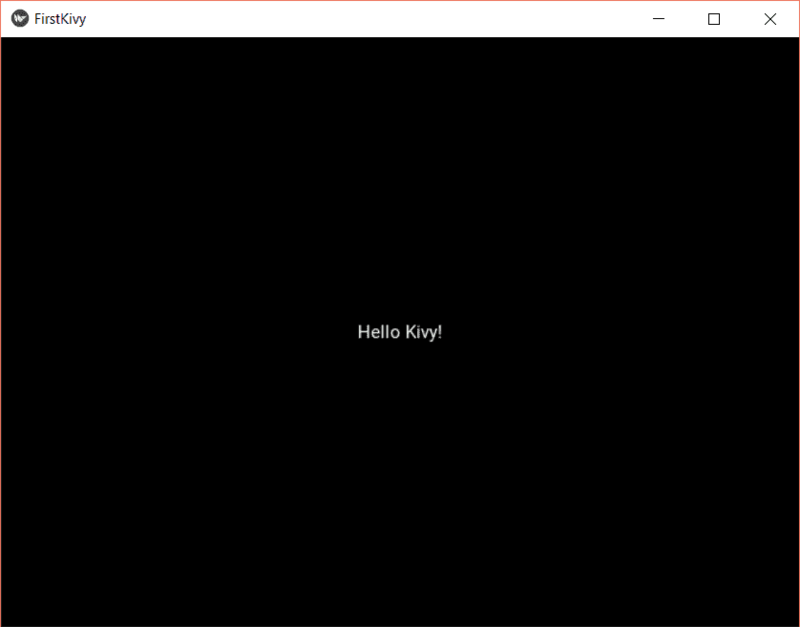 The other way to load the kv file using the Kivy Builder. Inside the triple quotation marks, the required widgets are added along with their properties. In the example below, we have added a KivyButton class. First, the text and size of the button are set, then the image is specified in the source attribute and the image coordinates. The image is placed on the same directory, so the image path is fine now. The file here contains all Kivy widgets definition. In our first GUI app, we added a label to our form, but this time, we will play with the label properties. 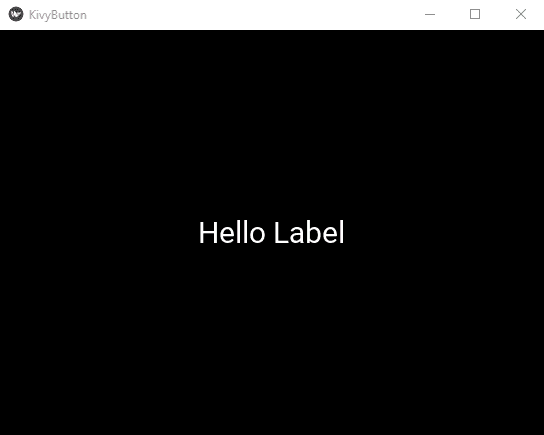 A label is used to add text to our GUI. 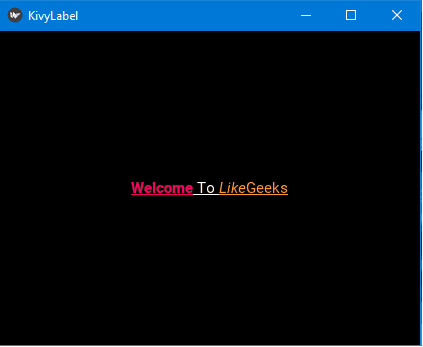 ASCII and Unicode strings are supported by a Kivy label. In this section, we will change the styles of the text in the label. Where the [u][/u] for underline font, [b][/b] for bold font, [i][/i] for italic font, and [color][/color] for colorizing the font. Assume that you have a great number of widgets to be displayed on your screen which may affect the performance. The goal of RecycleView is to arrange the view groups on the screen. RecycleView is memory efficient as it loads contents into memory according to the size of the screen, unlike ListView where all items are loaded into memory. One of the key features of RecycleView is that it supports animation. RecycleView can create an interactive and efficient scrollable list. View Holder which holds a view and helps the recycling. The adapter which is used to adapt the data to display in the list. The ScrollView in Kivy provides a scrollable view. Using scrollview, we can scroll through x axis as well as y axis on the screen. First, we will import a new function called runTouchApp(). 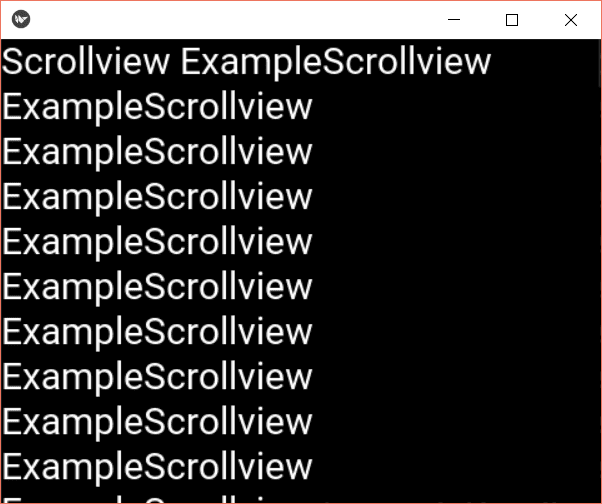 This function will make our scrollview touch enabled. In this section, we will create a text field and a button to clear the text field content. Let’s create a BoxLayout to add our widgets inside our class. After the input field, we have to create a button which clears our text. For this, we will create a clearText method which sets the text to an empty string and we will call this method when the button is pressed that is by using the on_press property of the button. Therefore, when we press the button the text will be erased. The Kivy clock object is used to schedule a function call after specific intervals. In this section, we will create a button. The text of the button will be changed after every 2 seconds. Now, create a button and using clock.schedule_interval we will call a user-defined function after every 2 seconds. Each time the function is called the value of the counter variable is incremented by 1 which is printed on the button. The dt argument is used to elapse time between the scheduling and the calling of the callback function. if no argument passed, it will throw an error about the callback function that it takes 1 positional argument but 2 were given. Every 2 seconds, the button text will be changed as expected. The graphical representation of a widget is represented by Kivy canvas. You can draw what you want inside a canvas. In this section, you will learn to create a canvas and how to draw a rectangle on the canvas. We are going to create a canvas in boxlayout and then a rectangle on the canvas. In this code, we have a BoxLayout class named MyWidget. Now the kvWidget string defines a canvas with its color property and a rectangle with the same size and position of the BoxLayout. To add an image to the canvas, we will create a rectangle equal to the size of the canvas and then will add an image on the rectangle. Like Kivy, PyQt is also used to create GUI applications, but PyQt is best known for desktop applications. Although we discussed Kivy here to build desktop applications, Kivy is commonly used for mobile applications due to Kivy widgets capabilities in multitouch. PyQt library is available in other programming languages such as C++ while Kivy is only available in Python. 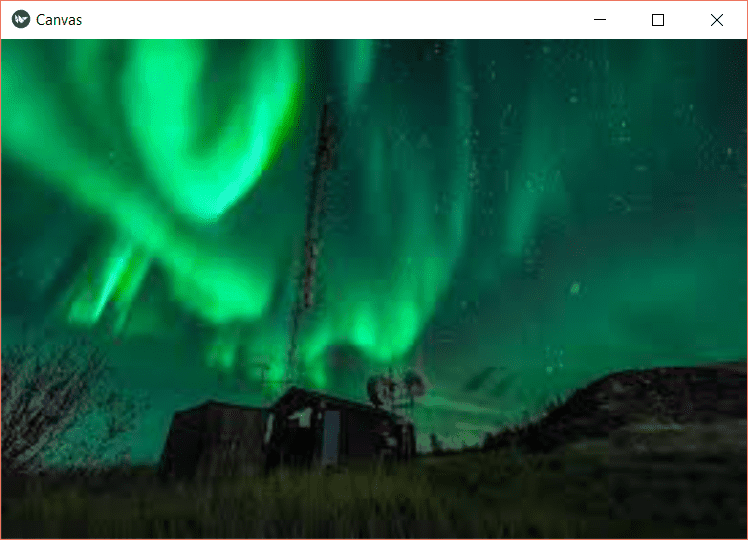 Kivy uses OpenGL interfaces to draw widgets directly on the screen, so you can also create games with good graphics. 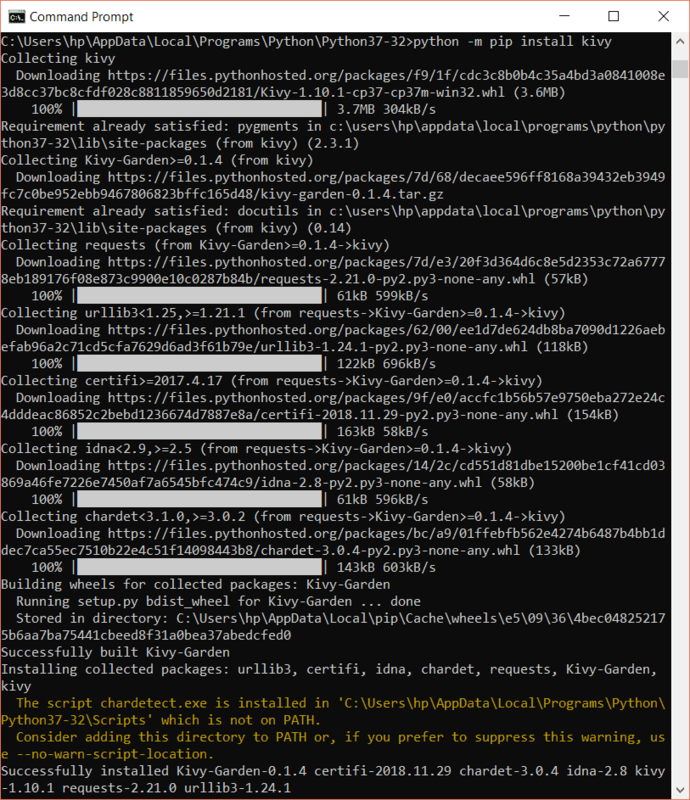 I hope you find your suitable Python GUI framework to build what you need. At last, we discussed many examples for Kivy and previously Tkinter, PyQt5. Which one do you prefer in building your graphical interfaces?